Samsung's new Galaxy S8 and S8+ smartphones will cost $750 and $850, respectively. The phones share almost all features other than size and both ship with 64 GB of internal storage. All carriers are bundling in the new Gear VR with controller at no added cost ($129 value), and will upgrade the bundle to include a 256 GB memory card and Harmon Kardon headphones for $99. The Galaxy S8 and S8+ will be available for preorder starting March 30 and should reach stores April 21. AT&T: AT&T is offering a buy-one, get-one deal with the S8 and S8+. Monthly prices range from $28 to $36, depending on the length of the installment plan. Further, AT&T is selling the Gear S3 for $50 with an S8/S8+ purchase, provided the customer signs a two-year agreement. Last, AT&T is offering either the Galaxy Tab E or Gear S2 for 99 cents with a service agreement. T-Mobile: The S8 will cost $30 month on a T-Mobile installment plan, and the S8+ will cost $30 per month, too, with a $130 down payment. T-Mobile says MetroPCS customers will have access to the Galaxy S8 when it reaches stores April 21. Sprint: Sprint plans to lease the phones. The S8 will cost $31.25 per month for 18 months while the S8+ will cost $35.42 per month for 18 months. Customers will be able to upgrade to a newer Samsung phone after making 12 payments. People who preorder the phones from Sprint will be entered into a sweepstakes that includes prizes such as television sets. Sprint says Boost Mobile and Virgin Mobile will offer the phone on April 21. Verizon Wireless: Verizon is offering the S8/S8+ for as low as $15 per month with an eligible (flagship-level) trade-in. Without a trade-in, the S8 will cost $30 per month and the S8+ will cost $35 per month for 24 months. 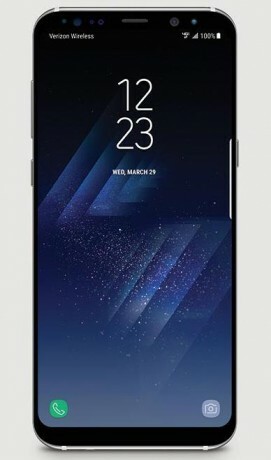 The Galaxy S8 and S8+ have 5.8- and 6.2-inch screens, respectively, Snapdragon 835 processors, 12-megapixel cameras, and Samsung's Bixby voice interface. You would think with Samsung's gigantic, costly fiasco with their last phone and their non-removable battery they would make this new phone have a removable battery. Had their last phone had that ability, they could have just sent out replacement batteries for the bad ones instead of replacing the whole phone. I guess they didn't learn. You can't fix stupid. Hard to have an IP68 certification water resistance rating with a removable battery. I'd take IP68 over it. ...Sprint...are you kidding me right now? One of the largest phone unveilings of the year, and you're MIA???? Hope this gets updated quickly. Sprint normally waits for all the other carriers to announce their promos, so we can beat them at the punch. I bet you Sprint will have the best promo for these phones, wether it be a BOGO, accessory deals or the monthly amount. Smart!